The Daily Fantasy Playbook series will leverage my countless hours of researching and playing DFS to outline strategies you can use to quickly gain a competitive advantage at picking players at each position, starting with quarterback. I'll reveal the keys to making accurate projections, the tactics to minimize busts in cash games, and the strategies that first-place guaranteed prize pool lineups have been using to win millions of dollars. While taking the time to master bankroll management, contest selection, game theory, etc., will undoubtedly improve your game, DFS ultimately comes down to making the best predictions. There are a lot of quarterback stats and metrics floating around, but making accurate projections comes down to separating the signal from the noise. In 2016, Aaron Rodgers and Drew Brees were both in the top five in pass attempts, so it's not surprising that they both finished as top-three fantasy QBs. But wait—Joe Flacco and Carson Wentz were also both in the top five in pass attempts. Breaking: Joe Flacco and Carson Wentz did not finish as top-three fantasy QBs. In fact, neither one of them managed to finish any higher than 20th. So what gives? Data from 2013-16 and does not include non-starting QBs. Passing yards and passing touchdowns are awarded fewer points than rushing/receiving yards and rushing/receiving touchdowns (and no points are awarded to the passer per completion), creating a situation where the average pass attempt is worth less than the average rushing attempt or receiving target. Quarterbacks don't have to fend off teammates for precious opportunities like players at the other positions do, which causes the deviation between high- and low-volume players at quarterback to be smaller than that of high- and low-volume players at the other positions. Since it's tough for a quarterback to separate himself in fantasy by attempting more passes than his peers, he instead needs to do so by being efficient. Inherently, being an efficient passer means attempting fewer passes than an inefficient passer: a higher completion percentage means fewer incomplete pass attempts; a higher yards-per-attempt average means fewer pass attempts are necessary to gain a given amount of yardage; and a higher touchdown rate means fewer pass attempts are necessary to throw a touchdown. Those ideas are also flawed because fading quarterbacks playing on favorites means fading quarterbacks whose teams have the highest Vegas implied team totals. Save for an actual fantasy projection, Vegas implied team total will be more strongly correlated to quarterback fantasy production in a given game than any other stat or metric available beforehand. Passing now accounts for roughly two-thirds of the average NFL team's offensive yardage and touchdowns. So, it should be no surprise that a projection of how many points a team will score is also useful for projecting the individual stats of its quarterback. Outside of being part of the implied-points calculation, looking at the size of the spread doesn't serve much use when projecting quarterback performance. The spread itself is still useful for differentiating between favorites and underdogs, however, which has implications in cash games and tournaments be discussed later on. We both know it's easy to get caught up looking at game logs, using recent performance to confirm narratives such as "he's been seeing the field well lately," or "his footwork has been messed up right now," or "Tim Tebow stinks." But how much does a quarterback's recent performance really tell us about his upcoming performance? And which stats should we be looking at, exactly? To find out, I did a regression analysis on the relationship between a quarterback's fantasy points in a given game and his season-to-date averages in various stat categories. I did this for all possible in-season sample sizes, i.e., from 1 game to 14 games. Fantasy points per game: Most predictive with a sample size up to 6 games. Fantasy points per attempt: Most predictive with a sample size of 7+ games. Data from 2014-16 and includes the top 30 fantasy QBs from each season. 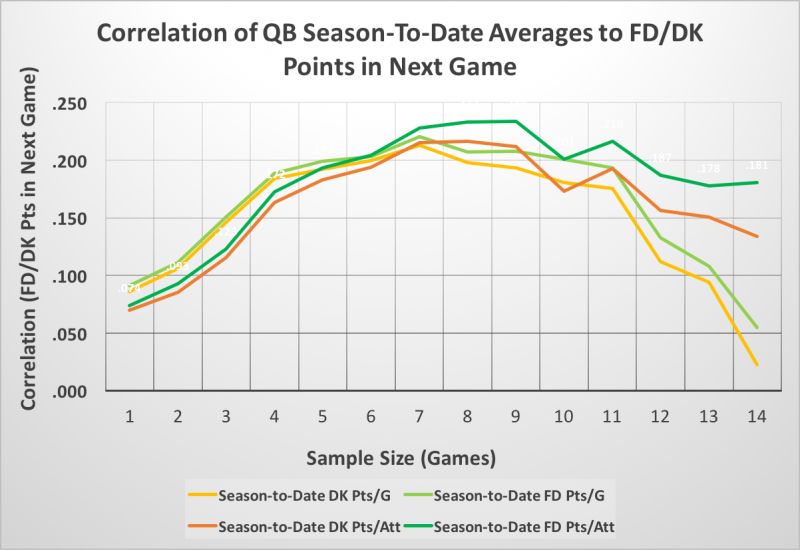 The data suggests we'll get diminishing returns if we're looking at a sample size beyond 8–9 games for a fantasy QB. The fact that the optimal sample size for projecting QBs peaks runs in contrast to the other positions. For non-QBs, predictiveness continues to increase as sample size gets larger. This is something to keep in mind later on in the season (aka Live Event season!). It's easy to get caught up in recency bias, but there's almost no correlation between quarterback performance from one game to the next. In fact, the most recent game is less predictive for a quarterback than any other position. 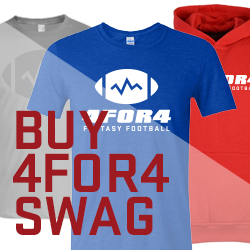 Click to become a 4for4 DFS Subscriber now! Not too long ago, "pay up at QB" was the accepted maxim in DFS. More recently, the trend has been to bargain hunt; the position is now considered to be brimming with safe plays that can still net at least 10 points on a bad day. But either one of those approaches can be risky as a starting point. Instead, lineup decisions should be made based on opportunity cost. Many DFS players make decisions based on linear value multipliers, i.e., 2 points per $1,000 (aka 2x) on FanDuel or 3 points per $1,000 (3x) on DraftKings. This can lead to sub-optimal lineup decisions, however—especially at QB. Due to their linearity, those multipliers fail to take into account that QBs score more points per dollar on average than non-QB positions. 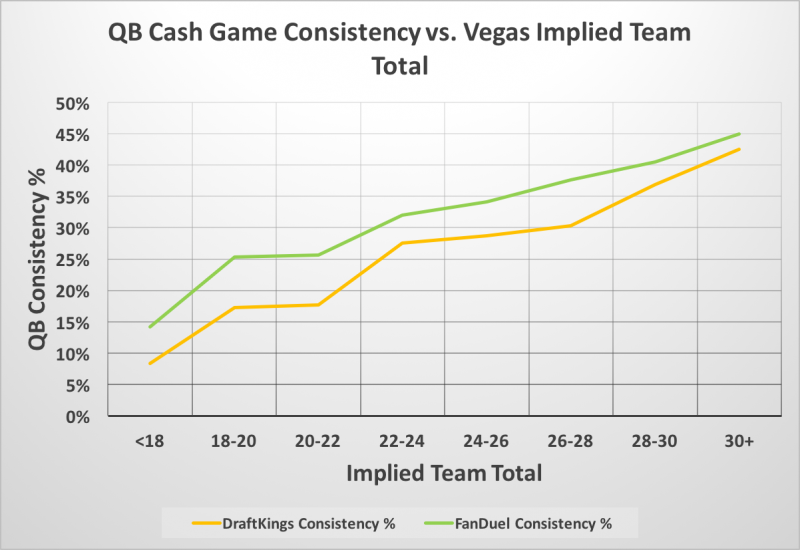 Without getting into why targeting a specific cash line is a slippery slope due to natural variance, let's go over exactly how aiming for a linear multiplier like 2x or 3x makes a lineup vulnerable. I just hung the hypothetical you out to dry, because Savage only reached 1.29x value. But no matter how many points Savage scored, it would have been a mistake to target only 2x for him. Nearly half of the QBs on that Saturday slate reached at least 2.7x. And nearly half of all QBs on FanDuel reach at least 2.4x value every week. By targeting 2x value—or any linear equivalent—with no regard for position, you would fail to account for each fantasy position's unique scoring expectation. You would also fail to account for salary-based expectation, i.e., the cheaper a player is, the higher his value multiplier needs to be. For example, 27 points at a $9,000 salary is more valuable than 12 points at a $4,000 salary even though both are technically 3x value. For example, take Week 1 of last season: At a FanDuel salary of $9,000 would indicate that Aaron Rodgers needed roughly 21 points—2.34x—to hit value; at $5,000, Dak Prescott needed 16.3 points to hit value, but that results in a much higher target multiplier of 3.26x. Essentially, the minimum number of points you would target from a QB is 20.9 on DraftKings or 16.3 on FanDuel. Then for every $1,000 increase in salary, 0.87 points (DraftKings) or 1.18 points (FanDuel) is added. More value is required from QB than any other position. Identifying top plays is only part of the puzzle in the DFS. Any pick you make will only be as valuable as how strong it makes your lineup as a whole. Therefore, you need to take opportunity cost into account. For instance, is paying up for Tom Brady worth it if it means you can't fit David Johnson? DraftKings seemingly decreased their QB salary ceiling starting in 2015. This resulted in roughly 8 out of every 10 QBs being bunched in the $5,000–$7,000 range each week. This can exploited by aiming to use the cheapest viable QB option on the slate. Paying up at QB should essentially be viewed as a luxury. Clear value plays at other positions need to be available to offset the opportunity cost of paying up at QB. Historically, there's been no difference in consistency rate between a QB on DraftKings priced as high as $7,500 and one priced as low as $6,000. There has been a major difference, however, between the value of a top-dollar RB or WR and the more inexpensive options. This suggests paying up at those positions should be prioritized over paying up at QB. Data does not include non-starting QBs, RBs/WRs projected under 9.0 points, and TEs projected under 7.5 points by 4for4 in a given game. DraftKings salary is less predictive of fantasy points for quarterbacks than for any other fantasy skill position.1 As long as risky options (such as underdogs, which we'll get to next) are eliminated, building around the cheapest viable QB on DraftKings is a sound approach. Since QBs tend to score significantly more points per dollar than non-QBs on FanDuel, the cheapest QBs on a given slate will tend to have the best point-per-dollar projections. But more often than not, those cheap QBs end up busting. Data does not include non-starting QBs, RBs/WRs projected under 9.0 points, and TEs projected under 7.75 points by 4for4 in a given game. QBs priced in the $6,000s and low $5,000s have collectively failed hit value consistently enough to offset the amount of raw points more expensive options produce. There will undoubtedly be exceptions from time to time, but the best approach on FanDuel will generally be to not punt QB. On the other hand, QBs priced $9,000+ have been extremely consistent. It won't always be necessary to pay $9,000+, however. since QBs become more consistent than RBs and WRs starting in the mid-$7,000s. Due to positional scarcity, it usually makes more sense to pay for consistency at RB and WR first if necessary. You don't want to be one of those DFS players that thinks only in terms of points per dollar. Expanding your thought process to include probability—like we just did when reviewing positional consistency rates—can provide a major edge. That's what cash games are all about: maximizing the probability that your lineup scores a sufficient amount of points to be profitable each week. Since cash game target scores are adjusted for salary-based expectation, they are extremely useful for comparing the consistency rates of differently priced QBs with all the various possible Vegas odds. 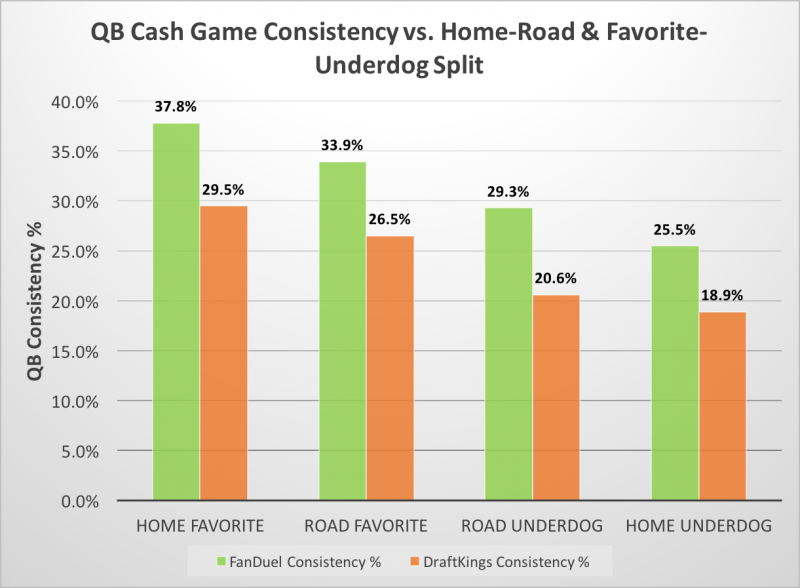 Classifying home-road and favorite-underdog splits in terms of their four possible combinations rather than as two separate splits helps to maximize predictiveness. While doing so is a small and perhaps obvious detail, it can dramatically increase your cash game lineup's floor. Using the cash game target scores is critical here because traditional point-per-dollar splits would have failed to demonstrate the true value of a home favorite. For example, looking only at average points per $1,000 of favorite QBs (2.94) versus underdog QBs (2.82) would have indicated just a minimal four-percent edge for the favorites—the cash game target scores reveal the edge is much larger. The discrepancy between favorite and underdog QBs is so large that underdog QBs should arguably almost never even be considered in cash games. Because the average consistency rate of QBs is 32.2 percent on FanDuel and 24.1 percent on DraftKings, an implied team total of 22 also marks the break-even point where QBs begin to perform with above-average consistency. An implied team total of 26+ is ideal, however—that's where all QBs start to match the consistency rate of the average home favorite. Note: Data in this section was compiled from first-place lineups in the 2015–16 DraftKings Millionaire Maker and FanDuel Sunday Million GPPs. Because every team's quarterback will be good for 25+ pass attempts in most weeks, you could technically make (at least a poor) case for playing almost any QB in a tournament. This is especially true if you were going to stack the QB with his receivers (more on that coming up in a few moments). But certain types of QB picks simply don't carry enough upside. It's essential to narrow down your player pool of QBs to those that check at least some of the boxes of a high-upside play. At $6,359, the QB slot in first-place lineups ranked fourth in average salary, behind WR1 ($7,994), RB1 ($6,850), and WR2 ($6,666). A large gap in average salary exists between QB and lineup slot with the next-highest average salary (RB2, $5,044). Despite just over one-quarter of all QBs being priced in $6,000–$6,900 range over last two years, first-place Millionaire Maker lineups used one in that range nearly half the time. Despite half of all QBs being priced in the $5,000–$5,900 range over the past two years, only 35 percent of first-place lineups used one in that range. QB in first-place Millionaire Maker lineups scored 35+ points roughly one-third of time, 30+ roughly two-thirds of the time, and 25+ roughly 8.5-of-10 times. Among QBs to score 25+ points over the past four seasons, roughly three-quarters either passed for 300+ yards, threw for 3+ touchdowns, or both. Home favorite QBs accounted for the largest percentage of QBs to score 25+ points (43%, significant because it greatly exceeds home favorites' one-third share of the overall population). Road underdog QBs made up the second-highest percentage of 25-point scorers (25%, significant because it falls below the 33 percent expectation). 4for4 projected ranking in QB6–QB10 range (23%) and QB11–QB15 range (22%) weren't far behind QB1–QB5; middle salary tiers have been good place to find low-owned QBs without sacrificing value. Average salary in first-place Sunday Million QB was $8,109, second to only WR1 ($8,409). Sweet spot was $8,000–$8,900 (47 percent of first-place lineups in past two years used QB in that range, but just 22 percent of QBs overall were in that range). QBs in first-place Sunday Million lineup scored 35+ points 15 percent of the time, 30+ points 44 percent of the time, and 25+ 79 percent of the time. Over past four seasons, 83 percent of QBs that scored 25+ on FanDuel threw 3+ touchdowns, but just 69 percent hit the 300-yard mark (due to FanDuel's touchdown-dependent scoring system relative to DraftKings). Home favorites made up largest percentage of QBs to hit 25-point benchmark (44%); road underdogs second-most common (25%). 4for4 weekly positional ranking of QB6–QB10 accounted for significantly larger share of QBs that scored 25+ points (24%) than QB11–QB15 (17%, explains why first-place lineups in Sunday Million paid up more at QB than in Millionaire Maker). Even if you're a DFS neophyte, you probably know that stacking is a good tournament strategy, and data backs it up. Pairing a quarterback with one of his teammates is a strategy that the majority of first-place Millionaire Maker and Sunday Million lineups have used, although Sunday Million lineups (94%) have done so more than Millionaire Maker lineups (72%). Roughly two-thirds of QB stacks in both sites' first-place lineups have been two-man stacks, the majority of which contained a WR. Shy away from stacking QB with an expensive WR: I don’t think I’ve heard anyone talk about this yet, but of WRs priced $8,000+ to appear in the first-place lineups, only 28 percent on FanDuel and 17 percent on DraftKings were paired with their own QB. The average price of a WR in a QB-WR stack was a modest $7,469 in the Sunday Million and $6,085 in the Millionaire Maker. Stack the QB with an opposing pass-catcher: A pass-catcher from the opposing team was included in nearly one-third of QB stacks in both sites' first-place lineups. Including opposing pass-catchers in a QB stack is an underrated strategy—especially given the relatively strong correlation between opposing passing games. WR1 determined by most expensive WR in lineup, WR2 determined by second-most expensive WR in lineup, and so on. QB ownership is easy to exploit. There tends to be a dozen or so viable QBs each week, but the field tends to disproportionately favor the top one or two chalk options. This creates a situation where a number of QBs end up with low ownership that doesn’t truly reflect their odds of being one of the week’s top scorers. In other words, the odds of chalk QBs are overstated while the odds of all other viable QBs are understated. You don't need to deliberately be contrarian at QB—you simply need to exploit ownership inefficiencies by fading the chalk. Is projected to be efficient. Has a high implied team total. Has had a poor fantasy performance recently that can't be attributed to anything other than natural variance. Is projected outside the top 10. Is teammates with a cheap WR in your lineup (preferably one that is also projected to be low-owned). As a final note, remember to avoid recency bias at all costs. As mentioned earlier, the correlation of QB fantasy points from one game to the next is almost non-existent. It may feel uncomfortable to fade a popular QB option that is coming off a good game, but the better move will almost always be to play a viable option projected for low ownership that is coming off a poor game. Weight efficiency more than volume. Leverage the predictiveness of Vegas implied team total. Use the correct stats and sample size when analyzing past performance. Fantasy points per game: Sample size of up to 5-6 games. Fantasy points per attempt: Sample size of 7+ games. Aim to get more value from QB than other positions. Allocate salary according to opportunity cost. FanDuel: Inexpensive options can be deceiving. Leverage Vegas odds to maximize consistency. Target home favorites and fade underdogs. Target Vegas implied team totals of 26 or more, and fade anything under 22. Target QBs that fit the high-upside profile. DraftKings: 25-point/300-yard upside, $6,000–$6,900, home favorite, ranked in top 15. FanDuel: 25-point/3-TD upside, $8,000–$8,900, home favorite, ranked in top 10. Exploit the little-known edges to stacking. Shy away from stacking the QB with an expensive wide receiver. Stack the QB with an opposing pass catcher. Photo by Kevin C. Cox/Getty Images.